Guests love to take something home from your party. 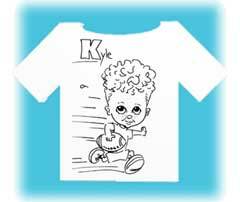 Our caricaturist can draw caricatures on t-shirts, boxer shorts, sports caps, beach towels or pillowcases. Sketches are done with permanent markers. Terms: per hour, plus the cost of the item.